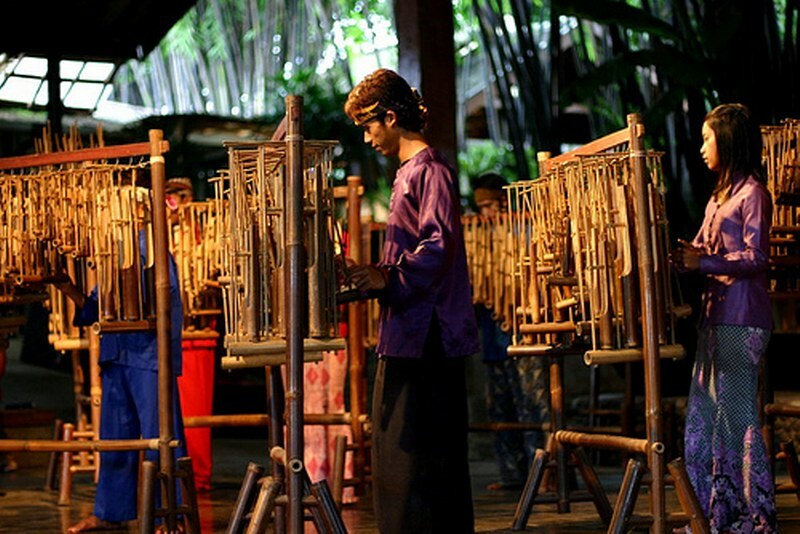 Saung Angklung Udjo (SAU) is a performance venue, a bamboo handicraft center, and a musical instrument workshop from bamboo. In addition, SAU has a goal as an educational laboratory and learning center to maintain Sundanese culture and especially angklung. Saung Angklung Udjo was built in 1966 by Udjo Ngalagena or also known as Mang Udjo together with his wife, Uum Sumiati, with the aim of preserving Sundanese traditional art and culture. Udjo Ngalagena is an angklung artist who feels from West Java. Born on March 5, 1929, Udjo Ngalagena is the sixth son of Wiranta and Imi. Udjo Ngalagena is familiar with angklung art with a familiar since the age of 4 years so do not be surprised if Udjo Ngalagena really love this art until finally founded Saung Angklung Udjo. In addition to angklung, Udjo Ngalagena also explore the traditional martial arts of Pencak Silat, gamelan, kecapi, as well as regional songs in Indonesian and Dutch. 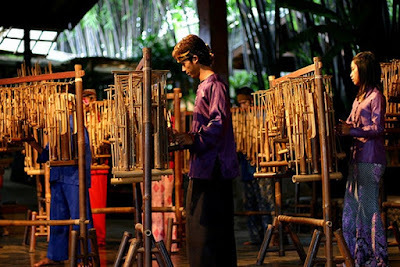 Therefore Saung Angklung Udjo not only presents angklung performances, but also various arts typical of West Java. After the death of Udjo Ngalagena on May 03, 2001, Saung Angklung Udjo still continued by the sons - daughters Udjo Ngalagena so Saung Angklung Udjo still crowded with visitors who want to witness the beauty of local traditional arts. Angklung is not only used to accompany the Sundanese songs only. In this angklung orchestra, will be played various types of songs, ranging from balloons, twinkle-twinkle little star, up to dangdut songs and Indonesian regional songs. The audience is also given the opportunity to play angklung. 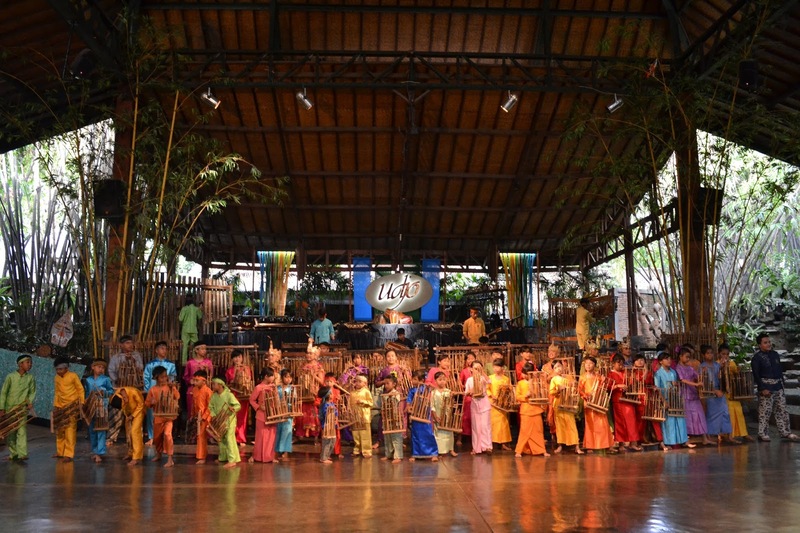 The children of Saung Angklung Udjo guidance will lend angklung with various numbers. With guidance and instruction from Saung Angklung Udjo, in a very short time, the audience can play some songs with the angklung. Staging a typical Sundanese wooden puppet-like puppet complete with costume. Every staging puppet show always has a moral message. Helaran is usually played for traditional ceremonies of khitanan and rice harvest ceremony. Because it aims to entertain and give thanks to God, the music is passionate and carefree. Angklung used for Helaran is a pentatonic angklung. Cirebon typical dance performed by women. First they will dance without using a mask. The story of the newscaster from Majapahit is investigating the state of Blambangan Kingdom. Then they began to dance in masks with the story of the messenger disguised as a man of gallantry against King Menakjingga. The red mask symbolizes the tempramental character. Saung Angklung Udjo is located at Jalan Padasuka No. 118, not far from the center of Bandung. To be able to reach Saung Angklung Udjo by private vehicle is very easy. If you drive from Jakarta, then you just need to exit the Pasteur toll gate and then go straight and fly the fly over across Jalan Surapati and Jalan Ph. Hasan Mustapa. Then you will see a signpost of Saung Angklung Udjo street at the end of Jalan Padasuka. You just need to turn following the board and within 200 meters you will arrive at Saung Angklung Udjo. No need to worry about going through this place unknowingly because Saung Angklung Udjo is very unique with lots of bamboo in front of it. - When using angkot from Surapati, take an angkot number 06 Cicaheum - Ciroyom route (Cicaheum direction) then get off at Padasuka intersection, from here you can walk about 500 meters or take a motorcycle taxi to Saung Angklung Udjo. 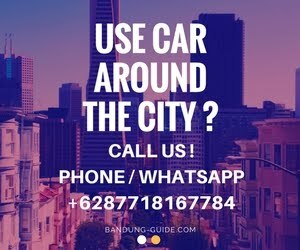 - If you get off at Leuwipanjang terminal, Railway Station or Husein Sastranegara Airport, then you just take public transportation route to Cicaheum terminal, because Saung Angklung Udjo Bandung is 100 meters before Cicaheum Terminal. After down public transport / public transportation / taxi, you can walk or rent a motorcycle taxi (Rp.10.000) to get to the exact location. Ticket performances also include drinks with a choice of: mineral water, tea, or ice candles and souvenirs of angklung-shaped keychains. - Guest House, As a cultural tourism area conceptualized One Stop Holiday, Saung Angklung Udjo also has lodging facilities and Guest House, So for those of you who want and feel at home with the atmosphere of exotic Sundanese cultural tourism here, can stay or spend the night here .As for the rental price of his room ranges from Rp.300.000 to Rp.900.000 / night. - Souvenir Shop, in this place also you can buy souvenirs or souvenirs in the form of various kinds of handicrafts, sepetti Bags, Sandals, Golek puppets, Key Chain and traditional musical instruments Saung Angklung Mang Udjo namely Angklung.